Background and Objective: Thalassemia is one of the most common hereditary disorders in the world, Beta thalassemia is much more diverse than the alpha type; it was estimated that about 4% to 7% of the world's population are carriers of beta thalassemia. In thalassemia, oxidative damage is increased, which causes damage to cellular components and functional disorders in the body. Oxidative injuries and stress are important factors for accelerating the aging process and the immune system response. Such frequent problems may cause local and systemic infections in the patients and financial damages to the society. Therefore, this study was performed to evaluate the strength of the immune response in patients diagnosed with thalassemia. Materials and Methods: This descriptive cross-sectional study was conducted in the Shafa Hospital Ahvaz. Peripheral blood samples were collected from patients with the beta-thalassemia minor (test group) and healthy individuals (control group) have been investigated. Results: Overall, 100 patients (48% female and 52% male) were enrolled and compared with the 100 healthy volunteers (56% femal and 44% male). 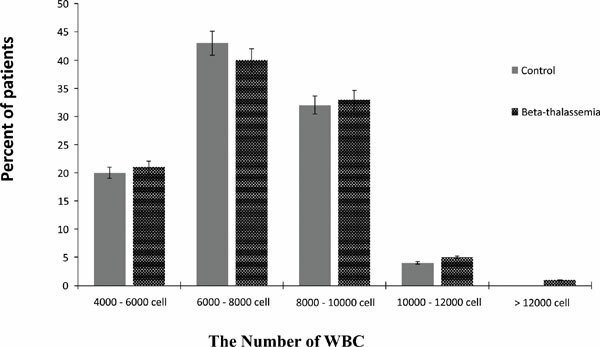 There was no significant differences in the number of WBC between the case and control groups (P>0.05). In the case group, 94% and 6% of the patients had normal and high WBC, respectively. Conclusion: It can be concluded that patients with thalassemia may be at risk for local and systemic infections due to many resaons, which include increased oxidative stress and decreased antigen presentation by dendritic cells, defects in chemotaxis or phagocytosis, neutrophil and monocytes, impaired natural killer cells activity and the immune response, increasing the dose of iron, lymphocytes, and other immune cells functions. Beta thalassemia, hereditary disorders, immune system, leukocytes, red blood cells, Shafa Hospital.